Bid farewell to the hustle and bustle of Saigon while settling into your cabin. The ship will begin by meandering along busy ports and waterways. Soon after, the change is abrupt and you will find yourself in the UNESCO listed Mangrove Biosphere Reserve of Can Gio which had been destroyed during the Vietnam War by toxic chemicals. Amazingly, the 75 hectares of forest has come back to life through a reforestation. Enjoy a cocktail reception at the Funnel Bar and Lounge followed by a Welcome Dinner on the Sun Deck. Drop anchor just outside of Cai Be for the night. Welcome to the circus of fish. The early birds will be treated to Thai Chi lessons on the Sun Deck. Brace yourself for a boat excursion to the exciting floating villages and catfish farms witnessing masses of bassa fish being fed, hand in hand with a shore excursion to the village of the local Muslim Cham community.Take a ride through this fascinating town of rich French colonial architecture and see its bustling market flooded with tropical fruits in full display by women in cone shaped palm leaf hats. Observe beautiful textiles being woven on old wooden looms; a tradition that has been passed from generation to generation. By mid-afternoon, The Jayavarman casts off for the border towards Phnom Penh. Before the sun rises, The Jayavarman sets sail to Kampong Chhnang via Prek K\’dam along the meandering Tonle Sap River, which narrows through leafy swaths of the South East Asian jungle. Take a walk through Kampong Louang, one of the last silversmith villages, to see the entire community involved in making various silver items to sell. Get back aboard The Jayavarman to eat lunch while cruising towards Kampong Chhnang. After lunch, take a motorboat excursion from Kampong Chhnang to see the wetlands, floating houses and fish farms in the region. Make a stop at a Heritage Line sponsored floating school to interact with the children and teach them some English! This is the day to truly experience rural Khmer life. In the evening, a mouth watering Farewell Dinner will be served on the Sun Deck. Depart before the break of dawn from Phnom Penh with a stop at the little known Chong Koh silk weaving village for a leisure walk. We cruise past the Mekong\’s tranquil villages and mind-blowing river life with scores of fishermen on duty. Visit Wat Nokor, a wat built within the ruins of an ancient temple that holds a timeless story. Then, travel to the Cheung Kok Ecotourism Village, a small villagedeveloped with support from Assistance Mediation Internationale (AMICA). Travelers can visit the village and take part in activities to experience village life. Profits from tourism go towards re-investment into long-term projects. Wake up in the wee hours of the morning, truly energized to embark on a journey upriver to the pre-Angkorian temple of Wat Hanchey. Located at the top of a hill overlooking the river, it offers some of the best views in Cambodia. Dating from the 8th century, these ancient structures do justice to the architecture of the Chenla Empire, which predated the glories of the mighty Angkor. Enjoy spectacular views of the surrounding well-organized rice paddy plains, as well as a travellers blessing performed by the local monks. Before the sun rises, The Jayavarman sets sail to Kampong Chhnang via Prek K\’dam along the meandering Tonle Sap River, which narrows through leafy swaths of the South East Asian jungle. Take a walk through Kampong Louang, one of the last silversmith villages, to see the entire community involved in making various silver items to sell. Get back aboard The Jayavarman to eat lunch while cruising towards Kampong Chhnang. After lunch, take a motorboat excursion from Kampong Chhnang to see the wetlands, floating houses and fish farms in the region. Make a stop at a Heritage Line sponsored floating school to interact with the children and teach them some English!This is the day to truly experience rural Khmer life. In the evening, a mouth watering Farewell Dinner will be served on the Sun Deck. This great lake dominates Cambodia and is over 150 km in length. The birdlife is profuse and from the middle of the lake one cannot even see the shores. Witness stillness and tranquility on the way to Siem Reap.The water level varies a great deal according to the time of the year and the amount of rainfall recorded. Thus, changes may occur for the different seasons. 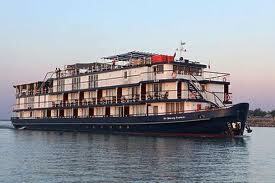 Cruise early morning to Prek K\’dam where you will disembark Jayavarman after breakfast. Board a coach at 9:00am which will take you to see a pre-Angorian temple on your way to Siem Reap. A packed lunch and refreshments will be available along the way. Arrive in Siem Reap early afternoon. Taxes, fuel, pilots, port dues, full board, welcome and farewell diner, mineral water, coffee and tea during breakfast. Free of charge for children below 5 years old, in parents\’ room and using existing bedding.